Vitamin D deficiency is associated with the development of asthma and allergy. The active form of vitamin D [1,25(OH)2D] regulates B cells in vitro and mice without the vitamin D receptor (VDR knockout [KO]) have high serum IgE. Whole-body VDR KO, T cell–specific VDR (T-VDR) KO, B cell–specific VDR (B-VDR) KO, and vitamin D deficient mice were used to determine the targets of vitamin D in the regulation of IgE in vivo. Vitamin D deficient, VDR KO, and B-VDR KO mice developed hyper-IgE, whereas T-VDR KO mice did not. 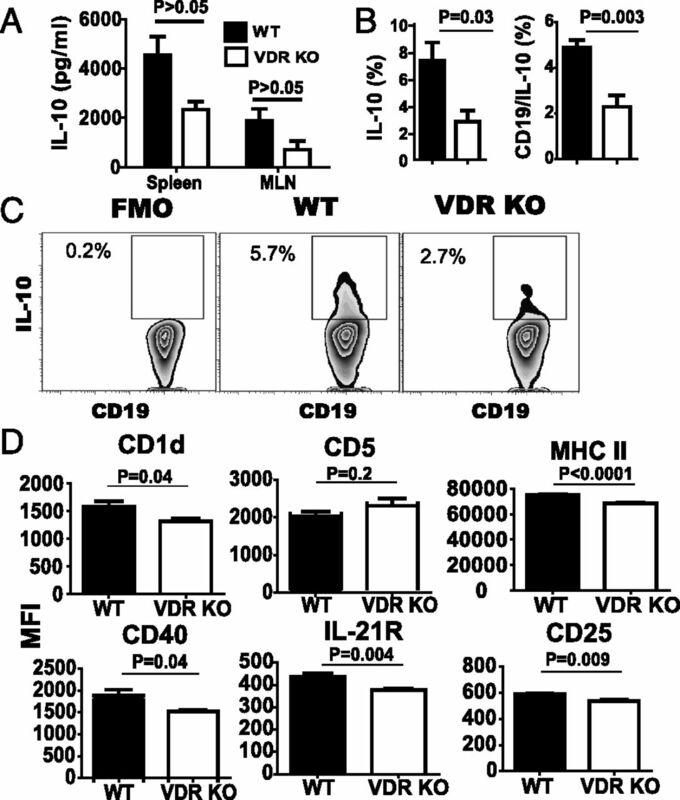 The data show that IL-10 secretion by B cells and CD1d expression on IL-10 secreting B cells was lower in VDR KO mice. Mesenteric lymph node cultures from VDR KO and B-VDR KO mice secreted higher IgE ex vivo than wild-type (WT) cultures, and the addition of IL-10 eliminated the difference in IgE production between VDR KO and WT cultures. The increase in IgE in VDR KO mice was 2-fold greater than in the B-VDR KO mice, suggesting that VDR deficiency in non-B cells contributes to hyper-IgE in vivo. Antibiotic depletion of the microbiota raised serum IgE 4-fold in both WT and VDR KO mice. The VDR directly and indirectly regulates IgE production in B cells. Through the VDR, vitamin D is an environmental factor that helps to maintain low serum IgE responses. Vitamin D is an important regulator of the immune system, and low vitamin D status has been associated with several immune-mediated diseases including multiple sclerosis, inflammatory bowel disease, and allergic asthma. Allergic asthma patients have lower levels of circulating vitamin D [25(OH)D] (1–3). Vitamin D status early in life has been suggested as an environmental factor that significantly contributes to asthma development (1, 2). Patients with allergic asthma have elevated serum IgE levels, and IgE neutralization has been shown to benefit patients with severe allergic asthma (4). Higher IgE levels have been shown to correspond with low vitamin D status in allergic individuals (5). A recent study showed that vitamin D supplementation of pregnant women resulted in lower serum IgE levels to mite Ags in the babies born (6). Vitamin D is a potential regulator of serum IgE and therefore of susceptibility to allergic asthma. Multiple different mechanisms have been described that act to maintain low serum IgE levels. The serum half-life of IgE is only 12 h in mice and 1–5 d in humans, which is by far the shortest average half-life of all Ig isotypes (7–9). Most IgE is bound to high affinity Fc receptors within the tissues and not in circulation (10). Mechanisms that contribute to the production and control of serum IgE include Th cells that secrete IL-4 and negative feedback regulation by CD23 (10). High levels of serum IgE have been found in CD23 knockout (KO) mice and germ-free (GF) mice have been shown to have high IgE levels because of high Th2 and IL-4 responses (11). In addition, the disruption of regulatory T cells (Tregs) in humans and IL-10 deletion in mice resulted in elevated serum IgE responses (12, 13). Circulating levels of IgE are normally kept very low by direct and indirect regulation of B cells. The vitamin D receptor (VDR) has been shown to be expressed by all cells of the immune system including T cells and B cells (14). VDR KO mice have hyper-IgE, but it is unknown what mechanisms account for this (15). In human B cells, the active form of vitamin D [1,25(OH)2D] inhibited in vitro IgE production (16). It also inhibited B cell proliferation, suppressed memory cell formation, and inhibited the ability of B cells to differentiate into plasma cells that produced IgE, IgG, and IgA in vitro (17). The functions of human B cells are regulated by 1,25(OH)2D in vitro. The in vivo effects of vitamin D and the VDR on B cells have not been studied. Experiments in this study were done to determine the mechanisms whereby vitamin D and the VDR regulated serum IgE levels in vivo. As in whole body VDR KO mice, B cell–specific VDR (B-VDR) KO mice developed hyper-IgE, but T cell–specific VDR (T-VDR) KO mice did not. Vitamin D deficient (D−) mice also had hyper-IgE as compared with vitamin D sufficient (D+) mice. 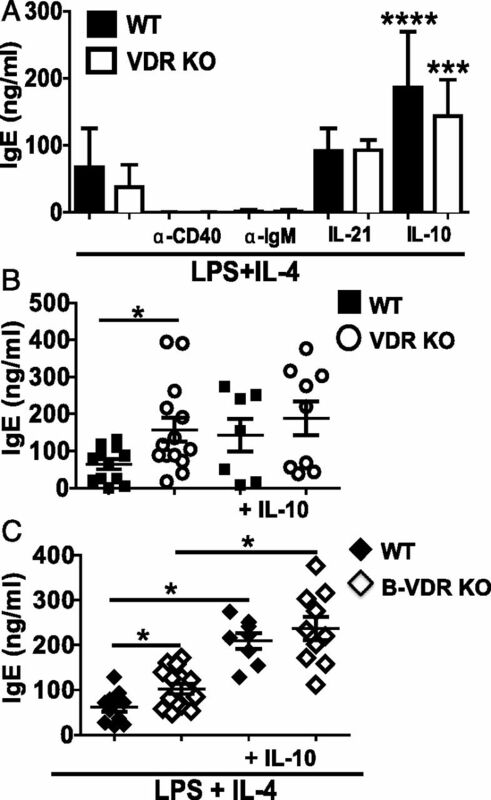 Elevated IgE levels in VDR KO mice were associated with a reduction in IL-10 secretion in lymphoid tissues, and fewer IL-10 secreting B (B10) cells. B cells, not T cells, accounted for the majority of the IL-10 produced following immunization with OVA. The reduction in IL-10 corresponded with lower expression of CD1d, MHCII, CD40, IL-21R, and CD25 on VDR KO B10 cells compared with wild-type (WT) B10 cells. In vitro mesenteric lymph node (MLN) and spleen cultures from VDR KO and B-VDR KO mice, but not purified B cells, showed hyper-IgE. The differences in IgE secretion between WT and VDR KO MLN cultures were eliminated after IL-10 was added to the cultures. The serum levels of IgE in age-matched VDR KO mice was 2-fold higher than in the B-VDR KO mice, suggesting that VDR deletion in non-B cells contributes to the IgE dysregulation in the VDR KO mice. Antibiotic (Abx) treatment of VDR KO mice accelerated the development of hyper-IgE to the same extent as it did in Abx-treated WT mice, suggesting an additive effect of the microbiota on hyper-IgE in VDR KO mice. The VDR is a direct and indirect regulator of IgE in vivo. Vitamin D status and signaling are two of several environmental factors (the microbiota) that control the serum IgE response to limit the development of potentially harmful allergic responses. C57BL/6 mice including WT, VDR KO, VDRfl/fl, CD19-Cre, Lck-Cre, and Cyp27B1 mice were bred and maintained at The Pennsylvania State University (University Park, PA). VDRfl/fl mice were a kind gift from Dr. S. Kato (University of Tokyo, Tokyo, Japan). VDRfl/fl mice were crossed with CD19-Cre (B-VDR KO) or Lck-Cre (T-VDR KO) mice, and were obtained from The Jackson Laboratory (Bar Harbor, MN). VDRfl/fl Cre+/− and VDRfl/fl Cre−/− (WT) littermates were used for experiments. GF C57BL/6 mice were from a gnotobiotic facility (Pennsylvania State University). For some experiments mice were fed synthetic diets to generate D− and D+ mice exactly as described (18, 19). Serum 25(OH)D was measured using a 25(OH)D ELISA set following the manufacturer’s instructions (Eagle Biosciences, Nashua, NH). For some experiments, broad-spectrum Abx (1 g/l ampicillin, 1 g/ml neomycin, 1 g/ml metronidazole, 0.5 g/l vancomycin) were delivered in the drinking water for 4 wk to deplete the microbiota. In addition, some experiments collected cecal contents from 16- to 20-wk old WT or VDR KO mice, diluted them (0.1 g cecal content/ml PBS), and orally gavaged the cecal contents into 6-wk old GF WT mice. All experimental procedures were approved by the Office of Research Protection’s Institutional Animal Care and Use Committee (Pennsylvania State University). On days 0 and 2, mice were given two i.p. injections of 0.1 mg OVA (Grade III; Sigma-Aldrich, St. Louis, MO) adsorbed in 1 mg aluminum hydroxide (Pierce, Rockford, IL). Injections were given in 150 μl sterile PBS. Splenocytes and MLNs were isolated and RBCs were lysed using a buffer containing 155 mM NH4Cl, 12 mM NaHCO3, and 0.1 mM EDTA. Cells were resuspended in RPMI 1640 medium containing 10% FBS (Thermo-Fisher Scientific, Rockford, IL), gentamicin, 2 mM l-glutamine, and 5 × 10−5 M 2-ME (Invitrogen, Carlsbad, CA). Cells were cultured with OVA 500 μg/ml for 72 h to collect supernatants. Cytokines were measured using BD OptEIA (BD Biosciences, San Diego, CA) mouse ELISA sets for IL-2, IL-4, IL-5, IL-10, IL-17, and IFN-γ following the manufacturer’s instructions. The limits of detection were 12.5 pg/ml IL-2, 31.25 pg/ml IL-4, 62.5 pg/ml IL-5, 31.3 pg/ml IL-10, 31.3 pg/ml IL-17, and 25 pg/ml IFN-γ. CD19 mAb-coated microbeads (Miltenyi Biotec, San Diego, CA) were used to purify splenic B cells by positive selection (>95% purity) using the manufacturer’s instructions. Purified B cells, whole splenocytes, or whole MLNs (1 × 106 cells/ml) were cultured with recombinant IL-4 (50 ng/ml; BioLegend, San Diego, CA) plus LPS (40 μg/ml; Sigma) for 5 d. In addition to IL-4 and LPS, some cultures contained anti-CD40 (2 μg/ml; eBioscience, San Diego, CA), recombinant IL-10 (50 ng/ml; BioLegend), recombinant IL-21 (100 ng/ml; BioLegend), or anti-IgM (2 μg; Southern Biotech, Birmingham, AL), and 40 μg/ml of anti-IL-10 or IgG1 control (both from BioLegend) for the 5 d culture. Total and OVA-specific Abs were measured using ELISA sets from BD Biosciences or eBioscience. Total serum IgE was measured by coating plates with purified Abs for mouse IgE. The limit of detection was 1.6 ng/ml IgE. For the detection of OVA-specific Abs, ELISA plates were coated with OVA Ag. Subsequent detection steps were performed using anti-mouse IgG1, IgG2c, or IgE (BD Biosciences). OVA-specific Abs in both serum and culture supernatants were measured in relation to background OD units from day 0 samples and a SpectraCount plate reader (Packard BioScience Company, Waltham, MA). Cells were stained with Abs for B220 (RA3-6B2), CD25 (7D4), CD117 (2B8), IgD (11-26c.2a), or CD103 (M290) from BD Pharmingen (San Jose, CA). CD19 (6D5), CD5 (53-7.3), CD138 (281-2), IL-21R (A49), CD40 (3/23), MHCII (M5/114.15.2), CD138 (281-2), CD11c (N418), and PE/Cy7-conjugated anti-mouse IL-10 (JES5-16E3) Abs were from BioLegend. For intracellular IL-10 staining, cells were stimulated in vitro in the presence of 10 μg/ml LPS (Sigma-Aldrich), 50 ng/ml PMA (Sigma-Aldrich), 500 ng/ml ionomycin (Sigma-Aldrich), and 2 μM monensin (eBioscience). Cells were stained for surface markers before fixation with 2% paraformaldehyde and membrane permeabilization with 1% saponin. Fluorescence minus one was used to determine the gating strategies. To analyze cells, a Cytomics FC500 instrument (Beckman Coulter, Hialeah, FL) was used before further assessment with FlowJo 7.6.1 software (Tree Star, Ashland, OR). Statistical analysis was performed using GraphPad Prism software (La Jolla, CA). One-way ANOVA with Tukey post hoc tests, two-way ANOVA with Bonferroni post hoc tests, and unpaired Student t tests were used to determine significance. A p value < 0.05 was the cutoff for statistical significance. IgE Abs circulate at low levels in the serum of WT mice (Fig. 1A). There was no change in serum IgE levels in WT mice between the ages of 8 and 20 wk (Fig. 1A). Consistent with what has been previously published (15), VDR KO mice had significantly higher total IgE levels than WT mice (Fig. 1A). Total serum IgE was the same in WT and VDR KO mice at 8 wk of age but significantly different at 20 wk of age. 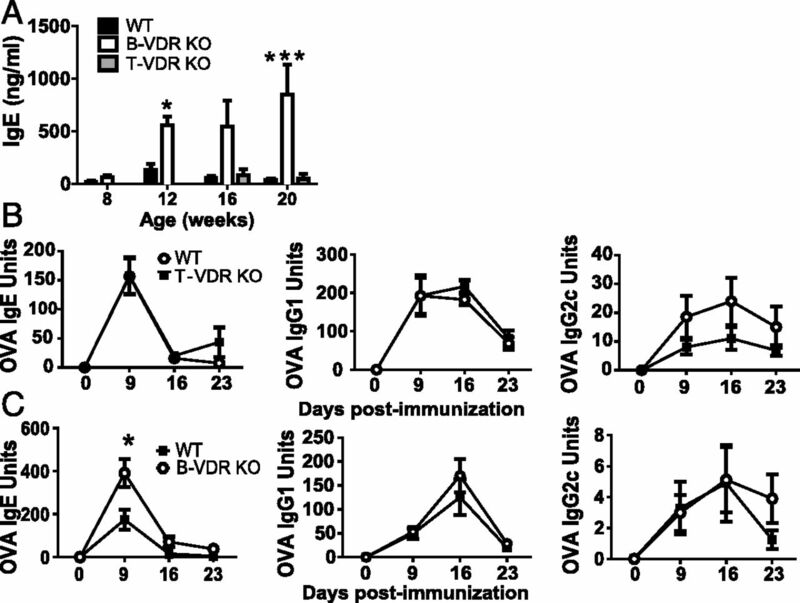 OVA-specific Ab responses were induced in WT and VDR KO mice by immunizing with OVA/Alum. The OVA-specific Ab response peaked at day 9 in all mice (Fig. 1). OVA-specific IgG1 was not different in WT and VDR KO mice (Fig. 1B). The OVA-specific IgG2c response was significantly lower in VDR KO mice than in WT mice (Fig. 1C, group effect p = 0.03). OVA-specific IgE responses in WT mice peaked at day 9 of immunization and then returned to undetectable levels (Fig. 1D). The OVA-specific IgE was significantly different at all days postimmunization in the VDR KO as compared with WT (Fig. 1D). In addition, the OVA-specific IgE response did not go back to baseline for at least 30 d postimmunization in VDR KO mice (Fig. 1D). VDR KO mice have high total and Ag-specific IgE Abs in the serum. To determine whether the high IgE levels in VDR KO mice were a result of increased B cell numbers or subsets, the frequencies and numbers of B cells were quantitated in WT and VDR KO mice. The total frequencies of B cells (CD19+ or B220+) were not different in the bone marrow (BM), spleen and Peyer's patches (PP) of VDR KO and WT mice (Table I). The MLN of VDR KO mice had significantly reduced frequencies of B cells compared with the MLN of WT mice (Table I). Because the numbers of lymphocytes isolated from WT and VDR KO MLN were not different, the total number of B cells in the MLN of VDR KO mice were also fewer than in the MLN of WT mice (data not shown). B cell development in the BM is as follows: B cells start out as IgM−IgD−CD117+ (pro B) cells, and downregulate CD117 to become IgM−IgD−CD117− B cells (pre B). Pre B cells further develop into immature IgM-expressing (IgM+IgD−) B cells and finally complete development into mature IgM+IgD+ B cells (20). There were no differences in the frequencies of total B cells, pre B and plasma cells in the BM of WT and VDR KO mice (Supplemental Table I). However, compared with WT controls, pro B and mature B cell frequencies were significantly lower in VDR KO BM, whereas immature B cell frequencies were increased (Supplemental Table I). There were no differences in CD23+ follicular B cells, CD21high marginal zone B cells, B1 (CD5+) or B2 (CD5−) cells in the spleen, MLN, and PP of WT and VDR KO mice (Supplemental Table I, Table I). The frequency of B cells in the peritoneal cavity were not different in WT and VDR KO mice (data not shown). There were few differences in B cell frequencies or subsets between VDR KO and WT mice that could not explain the hyper-IgE in VDR KO mice. The vitamin D 1alpha hydroxylase (Cyp27B1, Cyp) is required to produce 1,25(OH)2D from 25(OH)D. WT and Cyp KO mice were raised on D+ or D− diets. In the absence of 1,25(OH)2D (D+ Cyp KO mice), 25(OH)D will bind to the VDR with a 100-fold reduced affinity as compared with 1,25(OH)2D. D+ WT mice are the normal controls, D+ Cyp KO mice have 25(OH)D but no 1,25(OH)2D, D− WT mice have low levels of residual 1,25(OH)2D, and D− Cyp KO mice are devoid of all 1,25(OH)2D. Confirming the effectiveness of the diets, D+ mice had significantly higher 25(OH)D levels than D− mice (Fig. 2A). Total IgE levels were low in unimmunized D+ WT, D− WT, and D− Cyp KO mice (Fig. 2B). However, 4 of 11 D+ Cyp KO mice had elevated total IgE (Fig. 2B), which resulted in a higher mean total IgE in the D+ Cyp KO compared with D+ WT, D− WT and D− Cyp KO mice (Fig. 2B). OVA immunization of the D+ and D− mice resulted in significantly higher levels of OVA-IgE at day 9 postimmunization in D− mice compared with D+ mice (Fig. 2C) and no effect of Cyp KO genotype (data not shown). Some D+ Cyp KO mice had high total IgE but there were no differences in OVA-IgE responses at day 9 postimmunization between D+ Cyp KO and D+ WT mice. The data suggest that 25(OH)D does not completely compensate for the 1,25(OH)2D mediated effects on total IgE in the D+ Cyp KO mice but that OVA-IgE responses are completely compensated by 25(OH)D and do not require 1,25(OH)2D. Vitamin D deficiency resulted in higher OVA-IgE although there was no effect of vitamin D status on total IgE levels. To determine whether the VDR regulates IgE production indirectly in T cells or directly in B cells, the VDR was deleted in T cells using Lck-Cre–driven excision of the floxed VDR (T-VDR KO) or deleted in B cells using CD19-Cre (B-VDR KO). B-VDR KO mice had significantly higher levels of total IgE at 12 and 20 wk of age than WT or T-VDR KO mice of the same ages (Fig. 3A). The total serum IgE levels of age matched VDR KO mice was 2-fold higher than in B-VDR KO mice (compare Figs. 1A, 3A). There were no differences in OVA-specific IgE and IgG1 in T-VDR KO and WT controls (Fig. 3B). WT mice had significantly higher OVA-specific IgG2c responses (group effect: p = 0.04) than T-VDR KO littermates (Fig. 3B). Similar to whole-body VDR KO mice (Fig. 1D), B-VDR KO mice made significantly more OVA-IgE than WT littermates at day 9 postimmunization (Fig. 3C). The OVA-specific IgG1 and IgG2c responses were no different between B-VDR KO and WT controls (Fig. 3C). The data demonstrate a B cell intrinsic role for the VDR in limiting the IgE response in vivo. Total IgE in B-VDR KO mice was about half the total IgE in VDR KO mice at 20 wk of age (Figs. 1A, 3A), suggesting that VDR deficiency in B cells and in other cell types contributes to hyper-IgE. T cell-derived cytokines IL-4 and IL-5 are important for B cell class switching to IgE (21, 22). Lymphocytes from the spleen and MLN of WT and VDR KO mice were collected and restimulated in vitro with OVA at day 9 postimmunization. IL-4 was not detectable in the supernatants from either WT or VDR KO cultures (data not shown). There were no differences in the OVA specific IL-5, IFN-γ, IL-2, or IL-17 in spleen or MLN cultures from WT and VDR KO mice (data not shown). OVA induced IL-10 secretion was significantly higher in WT spleen and MLN cultures compared with VDR KO (Fig. 4A). There was reduced Ag-induced IL-10 production in VDR KO compared with WT mice. To determine which cell types produced IL-10 following immunization with OVA, the frequencies of IL-10 secreting cells were measured. WT cultures had significantly higher frequencies of IL-10 secreting cells than VDR KO cultures (WT: 7.3 ± 1.3% versus VDR KO: 2.8 ± 0.8%, Fig. 4B, 4C). In addition, the frequency of B10 cells in the spleen (Fig. 4B, 4C) and the peritoneal compartment of WT mice were higher than in VDR KO mice (peritoneal B10 cells WT: 14.5 ± 1.7% versus VDR KO: 8.0 ± 2.8%). Most of the IL-10 produced in the cultures was from B cells, because CD19+ B cells accounted for 67% of the total IL-10+ cells in VDR KO cultures and 82% of the IL-10+ cells in WT cultures (Fig. 4B). B10 cells express CD1d, CD5, MHCII, CD40, IL-21R, and CD25 at higher levels than B cells that do not produce IL-10 [Supplemental Fig. 1 (23)]. WT B10 cells had higher mean fluorescence intensity than VDR KO B10 cells for CD1d, MHCII, CD40, IL-21R, and CD25 (Fig. 4D). VDR KO mice had fewer B10 cells that made less IL-10, and expressed lower levels of several B10 activation markers than B10 cells from WT mice. Splenocytes and MLNs from VDR KO and WT mice were stimulated in vitro with LPS and IL-4 to produce IgE. When stimulated in vitro with LPS and IL-4, splenocyte and MLN cultures had detectable, but very low total IgE (Supplemental Fig. 2). The cultures were repeated using cells from day 9 OVA-immunized mice to increase the numbers of IgE-secreting B cells. Purified B cells produced only low levels of IgE in vitro when cultured with LPS and IL-4 alone, or LPS and IL-4 with the addition of anti-IgM or anti-CD40 Abs (Fig. 5A). The addition of IL-21 with LPS and IL-4 resulted in slightly more IgE production in vitro than without IL-21 (Fig. 5A). IgE production from both WT and VDR KO B cell cultures significantly increased in cultures with LPS, IL-4, and IL-10 (Fig. 5A). Regardless of the conditions used, there were no differences in IgE production when using the purified VDR KO and WT B cells in vitro (Fig. 5A). VDR KO and B-VDR KO cultures from immunized MLN or spleen showed higher IgE titers than the same cultures from WT mice (Fig. 5B, 5C, Supplemental Fig. 2). The addition of IL-10 to the MLN cultures eliminated the differences in IgE production between VDR KO/B-VDR KO and WT controls in vitro (Fig. 5B, 5C). However, addition of neutralizing IL-10 Abs to the VDR KO/B-VDR KO and WT cultures had no effect on IgE production from WT, VDR KO, or B-VDR KO spleen cultures (Supplemental Fig. 2D and VDR KO data not shown). It is not clear why neutralization of IL-10 had no effect on IgE production from whole spleens but perhaps the result is due to the complex effects of IL-10 on multiple B cell functions. Dendritic cells (DC) are important regulators of immunity and it is well described that CD103+ DC induce Tregs that produce IL-10. The frequencies of CD11c+/MHCIIhigh were not different in WT and VDR KO MLN but the CD103+ DC were significantly fewer in the MLN from VDR KO mice compared with WT (Supplemental Fig. 3). The data indicate that spleen and MLN cultures, but not purified B cells, from VDR KO or B-VDR KO mice overproduce IgE in vitro and that IL-10 addition eliminated the differences in IgE production in vitro. As reported by others, GF WT mice had higher levels of serum IgE than conventionally raised WT mice [Fig. 6A (11)]. Serum levels of IgG1 were the same whereas serum IgG2c was higher in conventional (CNV) WT mice compared with GF mice (Supplemental Fig. 3). In addition, it has been shown that 4-wk Abx treatments induced hyper-IgE in mice (24). VDR KO and WT mice have distinct gut microbiota (18). We determined whether differences in the microbiota were contributing to hyper-IgE in our VDR KO mice. VDR KO and WT mice were administered Abx as described (24). Abx treatment for 4 wk resulted in significant increases in serum IgE in both WT and VDR KO mice (Fig. 6B). IgE levels were significantly higher in VDR KO mice at 0, 2, and 4 wk after Abx treatment than in corresponding Abx-treated WT mice (group effect: p = 0.0002, time effect: p = 0.0005, and group by time interaction p = 0.01, Fig. 6B). IgE levels in B-VDR KO were also significantly higher after Abx treatment for 4 wk (Supplemental Fig. 3D). Interestingly, the IgE levels following 4-wk Abx treatment were not different in WT and B-VDR KO mice (Supplemental Fig. 3D). This is in contrast to the results from the Abx-treated VDR KO mice (Fig. 6B). Compared to serum IgE levels in age-matched WT and VDR KO (12-wk old) CNV mice, Abx treatment increased IgE 4-fold in both the Abx WT and Abx VDR KO mice (Fig. 6C). Abx treatment had an additive and not synergistic effect on hyper-IgE in the VDR KO mice. Furthermore, the data in Abx-treated B-VDR KO mice support an indirect role for vitamin D in non-B cells to limit IgE levels. Cecal transplants from CNV WT mice into GF mice eliminated hyper-IgE (11). To determine whether the microbiota from CNV VDR KO mice would succeed in suppressing IgE in GF mice, cecal transplant experiments were done from CNV WT and CNV VDR KO mice into GF WT mice. Cecal transplants from CNV WT mice were as effective as those from CNV VDR KO mice at eliminating hyper-IgE in WT GF mice (Fig. 6D). WT GF mice that received cecal transplants from either CNV WT or CNV VDR KO donors had very low serum IgE levels by 4 wk posttransfer (Fig. 6D). The microbiota from VDR KO mice was as effective as WT microbiota at resolving hyper-IgE in GF WT mice. VDR and vitamin D deficiency resulted in hyper-IgE in mice suggesting that through the VDR, vitamin D is one of the factors that controls serum IgE levels in vivo. Vitamin D deficiencies have been associated with high IgE levels in some populations (1–3, 5, 25). Polymorphisms in the VDR gene, as well as in several vitamin D metabolizing genes, have been identified and linked to asthma susceptibility (26, 27). These genetic polymorphisms in the VDR gene and other vitamin D-associated genes are genetic factors that may control how the host utilizes and/or responds to changes in vitamin D from the environment and the effects on serum IgE. Mice with B cells that do not express the VDR develop hyper-IgE, indicating vitamin D is a direct regulator of IgE in B cells. Our data show that expression of the VDR induced B10 cells that produce a significant portion of the IL-10 following OVA immunization. The data show that VDR KO mice have fewer B10 cells than WT mice. Allergen immunotherapy plus 1,25(OH)2D induced IL-10, suppressed serum IgE, and reduced the symptoms of experimental asthma in mice, but the source of IL-10 was not investigated (28). The effectiveness of 1,25(OH)2D was reduced in IL-10 KO mice with experimental autoimmune encephalomyelitis, suggesting that 1,25(OH)2D mediated immune suppression requires IL-10 production (29). The induction of T regs and IL-10 secretion from DC was thought to underlie the effectiveness of 1,25(OH)2D to suppress immune mediated disease (30–32). The production of IL-10 was induced by 1,25(OH)2D in human B cells, and IL-10 production by human memory B cells inhibited IgE production in vitro (33, 34). In addition, there may be IL-10 independent effects of 1,25(OH)2D on IgE class switching (17, 35). It seems likely that the source of the increased IL-10 in vivo following 1,25(OH)2D treatment could be from B10 cells. Our data support a role for vitamin D and the VDR in B10 cells and suggest that some of the immune regulatory effects of 1,25(OH)2D in vivo are likely an effect of induction of B10 cells. The role of IL-10 on B cells is complex. B10 cells have been shown to transiently produce IL-10 that can regulate innate and adaptive immunity (36). In addition, IL-10–secreting B cells can differentiate into Ab-secreting cells in vivo (37). Microbial depletion with Abx both increased IgE secretion and decreased B10 cell frequencies (24, 38). B10 cells that were transferred into T and B cell deficient mice and immunized with Ag differentiated into Ab-secreting cells that became a significant source of serum IgM and IgG (37). IL-10 inhibited IgE transcript expression and IgE production from IL-4 stimulated PBMCs in vitro (39, 40). In addition, IL-10 enhanced survival, proliferation, and differentiation of B cells (41). VDR expression was required for the induction of IL-10 in B cells and IL-10 addition eliminated differences in the IgE production between VDR KO and WT MLN cultures in vitro. The data suggest that the VDR regulates the development of B10 cells and the IL-10 acts further to suppress IgE synthesis in an autocrine manner. There was a 2-fold difference between the serum IgE levels in VDR KO (higher) versus B-VDR KO mice (Figs. 1A, 3A). In addition, ex vivo cultures from the spleen and MLN of VDR KO and B-VDR KO mice, but not purified VDR KO B cells, recapitulated the high in vivo IgE secretion (Fig. 5). Abx treatment of B-VDR KO mice induced hyper-IgE to the same extent as WT, whereas there was an additive effect on IgE secretion when the microbiota was depleted in VDR KO mice (Fig. 6, Supplemental Fig. 3). Together, the data suggest that other cell types (B cell extrinsic) regulate the production of IgE. It is well recognized that CD103+ DCs induce Tregs that affect IL-10 production and IgE secretion (39–41). VDR KO mice have fewer CD103+ DC (Supplemental Fig. 3) and inducible Tregs than WT mice (42). In addition, CD1d expression is reduced on the B10 cells from VDR KO mice (Fig. 4) and we have shown previously that CD1d expression is lower on thymic VDR KO cells as well (43). The reduction in CD1d expression in the VDR KO mouse was associated with a block in invariant NKT (iNKT) cell development and function (43). In particular, addition of 1,25(OH)2D to iNKT cultures in vitro induced IL-10 production (44). Although B10 cells express high levels of CD1d relative to IL-10 negative B cells, CD1d expression is not required for IL-10 secretion by B cells because the frequency of B10 cells was the same in WT and CD1d KO mice (data not shown). iNKT cells can provide help for B cells to both proliferate and produce Abs (45). Whether B10 cells influence the function of iNKT cells, and/or iNKT cells influence the function of B10 cells is as yet not known. Vitamin D and the VDR regulate inducible Tregs, CD103+ DC and potentially iNKT cells to indirectly control B cells, IL-10, and IgE production. The commensal microbial flora and the use of Abx are environmental factors that affect serum IgE levels (11, 24). The microbiota is affected by vitamin D status (18). The hyper-IgE in GF and Abx-treated mice has been shown to be due to excessive IL-4 secretion by CD4+ T cells (11, 24). There was a 4-fold increase in serum IgE levels in mice treated with Abx regardless of the genotype (Fig. 6). In addition, microbial transplant of the microbiota into GF mice using VDR KO donors was as effective as WT donors at suppressing serum IgE levels. The data suggest that vitamin D and the microbial induced inhibition of IL-4 are independent environmental factors that together regulate serum IgE levels. Vitamin D is a regulator of circulating levels of IgE. The direct effects of vitamin D on B cells is to induce B10 cells and the production of IL-10 by B cells that limit IgE secretion. In addition, there are indirect effects of vitamin D on other cell types that maintain the IgE response. Our data suggest that the potential benefits of vitamin D include control of the IgE response of the host through direct and indirect regulation. We thank Dr. Hector DeLuca for the Cyp27B1 KO mice and Dr. S. Kato for the VDRfl/fl mice. We thank the members of the Center for Molecular Immunology and Infectious Diseases for lively discussion and Veronika Weaver for technical assistance. This work was supported by National Institutes of Health/National Institute of Neurological Disorders and Stroke Grant NS067563 and National Center for Complementary and Alternative Medicine and the Office of Dietary Supplements Grant AT005378.
. 2012. Vitamin D deficiency as a strong predictor of asthma in children. Int. Arch. Allergy Immunol. 157: 168–175.
. 2014. Relationship between vitamin D and childhood asthma: a case-control study. Iran. J. Pediatr. 24: 710–714.
. 2011. Is high prevalence of vitamin D deficiency evidence for asthma and allergy risks? Eur. Ann. Allergy Clin. Immunol. 43: 81–88.
. 2016. “Real-life” effectiveness studies of omalizumab in adult patients with severe allergic asthma: systematic review. Allergy 71: 593–610.
. 2011. Vitamin D levels and food and environmental allergies in the United States: results from the National Health and Nutrition Examination Survey 2005-2006. J. Allergy Clin. Immunol. 127: 1195–1202. 2016. Vitamin D supplementation during pregnancy and infancy reduces aeroallergen sensitization: a randomized controlled trial. Allergy 71: 1325–1334.
. 1988. The half-lives of serum immunoglobulins in adult mice. Eur. J. Immunol. 18: 313–316.
. 1997. Handbook of Human Immunology, 1st Ed. CRC Press, Boca Raton, FL.
. 1985. Clearance of IgE from serum of normal and hybridoma-bearing mice. J. Immunol. 134: 3291–3297.
. 2003. The biology of IGE and the basis of allergic disease. Annu. Rev. Immunol. 21: 579–628.
. 2008. Primary immune deficiencies with aberrant IgE production. J. Allergy Clin. Immunol. 122: 1054–1062; quiz 1063–1054.
. 2001. IL-10 gene knockout attenuates allergen-induced airway hyper responsiveness in C57BL/6 mice. Am. J. Physiol. Lung Cell. Mol. Physiol. 280: L363–L368.
. 2000. Expression of 1,25-dihydroxyvitamin D(3) receptor in the immune system. Arch. Biochem. Biophys. 374: 334–338.
. 2004. Vitamin D receptor-deficient mice fail to develop experimental allergic asthma. J. Immunol. 173: 3432–3436.
. 2002. 1alpha,25-dihydroxyvitamin D3 inhibits anti-CD40 plus IL-4-mediated IgE production in vitro. Eur. J. Immunol. 32: 3395–3404.
. 2011. Targeting the vitamin D receptor inhibits the B cell-dependent allergic immune response. Allergy 66: 540–548.
. 2013. Vitamin D regulates the gut microbiome and protects mice from dextran sodium sulfate-induced colitis. J. Nutr. 143: 1679–1686.
. 1998. 1,25-Dihydroxycholecalciferol inhibits the progression of arthritis in murine models of human arthritis. J. Nutr. 128: 68–72.
. 2014. Stage-specific control of early B cell development by the transcription factor Ikaros. Nat. Immunol. 15: 283–293.
. 1988. IgE production by normal human lymphocytes is induced by interleukin 4 and suppressed by interferons gamma and alpha and prostaglandin E2. Proc. Natl. Acad. Sci. USA 85: 6880–6884.
. 1988. Interleukin 5 enhances interleukin 4-induced IgE production by normal human B cells. The role of soluble CD23 antigen. Eur. J. Immunol. 18: 929–935.
. 2012. Commensal bacteria-derived signals regulate basophil hematopoiesis and allergic inflammation. Nat. Med. 18: 538–546.
. 2014. Low vitamin D levels are associated with atopic dermatitis, but not allergic rhinitis, asthma, or IgE sensitization, in the adult Korean population. J. Allergy Clin. Immunol. 133: 1048–1055.
. 2013. Genetic variants in vitamin D pathway in Egyptian asthmatic children: a pilot study. Hum. Immunol. 74: 1659–1664.
. 2015. Childhood asthma and spirometric indices are associated with polymorphic markers of two vitamin D 25-hydroxylase genes. Pediatr. Allergy Immunol. 26: 375–382.
. 2008. 1alpha,25-dihydroxyvitamin D3 potentiates the beneficial effects of allergen immunotherapy in a mouse model of allergic asthma: role for IL-10 and TGF-beta. J. Immunol. 180: 5211–5221.
. 2006. IL-10 signaling is essential for 1,25-dihydroxyvitamin D3-mediated inhibition of experimental autoimmune encephalomyelitis. J. Immunol. 177: 6030–6037.
. 2000. 1 Alpha,25-dihydroxyvitamin D3 inhibits differentiation, maturation, activation, and survival of dendritic cells leading to impaired alloreactive T cell activation. J. Immunol. 164: 2405–2411.
. 2003. Tolerogenic dendritic cells induced by vitamin D receptor ligands enhance regulatory T cells inhibiting allograft rejection and autoimmune diseases. J. Cell. Biochem. 88: 227–233.
. 2009. Allergen extract-induced interleukin-10 in human memory B cells inhibits immunoglobulin E production. Clin. Exp. Allergy 39: 671–678.
. 2008. 1,25-dihydroxyvitamin D(3) promotes IL-10 production in human B cells. Eur. J. Immunol. 38: 2210–2218.
. 2010. Vitamin D receptor binds to the epsilon germline gene promoter and exhibits transrepressive activity. J. Allergy Clin. Immunol. 126: 1016–1023, 1023.e1011–1014.
. 2015. IL-10-overexpressing B cells regulate innate and adaptive immune responses. J. Allergy Clin. Immunol. 135: 771–780.e778.
. 2012. Regulatory B10 cells differentiate into antibody-secreting cells after transient IL-10 production in vivo. J. Immunol. 188: 1036–1048.
. 2014. Regulatory B cells are induced by gut microbiota-driven interleukin-1β and interleukin-6 production. Nat. Med. 20: 1334–1339.
. 1998. IgE versus IgG4 production can be differentially regulated by IL-10. J. Immunol. 160: 3555–3561.
. 1998. Role of interleukin 10 in specific immunotherapy. J. Clin. Invest. 102: 98–106.
. 2011. Converging pathways lead to overproduction of IL-17 in the absence of vitamin D signaling. Int. Immunol. 23: 519–528.
. 2008. The vitamin D receptor is required for iNKT cell development. Proc. Natl. Acad. Sci. USA 105: 5207–5212.
. 2015. NKT cells can help mediate the protective effects of 1,25-dihydroxyvitamin D3 in experimental autoimmune encephalomyelitis in mice. Int. Immunol. 27: 237–244.